It had been rumored for a long time, but now it’s official: Navy has signed a long-term agreement with Under Armour to outfit not only the football team, but the entire athletic department. Navy football had been with Nike since 2002, while other sports have had their own deals with various manufacturers (Navy lacrosse was actually with Under Armour for a few years in the late 2000s). Terms of the contract haven’t been revealed, although it was once rumored that the length of the deal is ten years. The Naval Academy joins recently-announced Notre Dame under the UA umbrella, along with other past and future Navy opponents such as Temple, Hawaii, South Carolina, Toledo, Boston College, Northwestern, Texas Tech, Utah, USF, and of course, Maryland. It’s that last one that seems to be causing the most angst among the Twitterati, with the fear that Navy will start wearing some of the crazier getups that UA has provided for the Terps over the last couple of years. That’s not how these deals work, though. Nike and Under Armour don’t dictate to these schools what to wear. Maryland wears these uniforms because they want to. It’s similar to the relationship between Nike and Oregon. UA founder and CEO Kevin Plank attended Maryland, just as Phil Knight attended Oregon. The two use their alma maters as showcases for their brands, while the schools leverage that relationship for marketing and recruiting. Just as every Nike school doesn’t dress like Oregon, every UA school doesn’t look like Maryland. Each school has plenty of input into the process and ultimately decides what gets put onto the field. Most UA schools have maintained something close to their traditional looks. 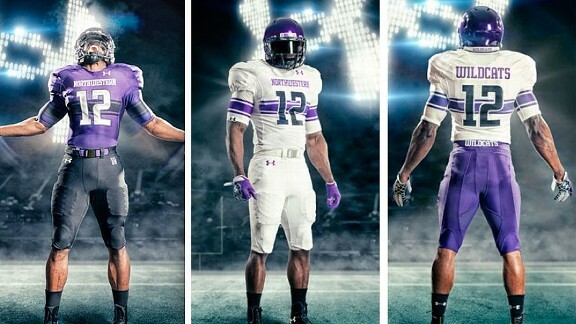 For all the hype about Maryland’s rebranding, Northwestern’s was one of the sharpest and classiest in the game. I’m sure there will be special one-time uniforms that some people don’t like, but some people didn’t like Nike’s Army-Navy uniforms either. It’s all in the eye of the beholder. One of the most important elements to this deal is that it’s for all sports. In the past, with different sports having separate deals with multiple manufacturers, there was a somewhat inconsistent look for the athletic department. Some teams wore blue and gold, while others wore more of a blue and yellow, for example. With one manufacturer willing to pay for all of Navy’s sports, it gives the school the ability to promote a more consistent brand image across the board. A more consistent brand sends a louder message, which is very important to any school, especially a service academy like Navy. Still, despite all the benefits, I’d be lying if I didn’t admit that the move is a little bittersweet. Nike was very, very good to Navy. I haven’t exactly been subtle in my praise for the Army-Navy uniforms of the last two years. Even if my desire to make them permanent was always going to be a pipe dream, it’s still a little sad for me to know that there’s no way it can possibly happen now. In the end, it’s just business. Along those lines, the decision to move to UA reminds me of another recent business decision from NAAA. Nike is the unquestioned leader of their industry, much like ESPN was when they were bidding for the television rights to Navy’s home football games. Instead of going with the more established company, though, Navy decided to sign with upstart CSTV. It was a great call. CSTV eventually morphed into the CBS Sports Network, but no matter what they called themselves at the time, they’ve always treated the Naval Academy like kings. As the network grew, they took Navy along for the ride. Hopefully, signing with another hungry up-and-comer in Under Armour will pay similar dividends. I like this deal. I think we can count on good support from UA, and I share your view on the consistent brand image! I also think we may see some nice Army-Navy uniforms that will be liked by some, and despised by others. I will look forward to seeing them regardless. I hope we see that it is a strong benefit to our teams! I hate the deal because I was hoping the Army/Navy game uniform would become standard issue. Those helmets were great. This deal is about a LOT more than the cool A-N helmets. I think we can all be assured if Chet made it there’s a significant financial upside to the NAAA. Somehow, under armors doesn’t sound quite right when talking about outfitting the men’s swimming team. I like the idea of a having a coordinated uniform appearance across all of Navy’s teams. That makes sense. Chet has wrangled good deals in numerous other contracts, so I have to believe that this one with UA is no different. Our colors are blue and gold. I hope the uniforms employ those colors. I favor that we continue using the Anchor and the USMC EG&A.I don’t like the blue or the white football pants and cringe at the sight of the white jersey/ white pants and the blue jersey/ blue pants football uniforms. Oh, well, more grist for the peanut gallery mill. Most importantly: WHO’S MAKING THE BLUE RIM T’S? Could you imagine heat gear blue-rims for plebe summer? Think of all the stuff you could by in the Mid store (or whatever they call it now)? The heavyweight crew has raced in a deep yellow jersey with a dark blue diagonal stripe and N for over 60 years; will that change? While I understand the decision to move in the Under Armour direction, I don’t necessarily agree with it. Nike, in my opinion, should outfit all Navy sports– the swoosh is a worldwide symbol of excellence and so is the Naval Academy crest. Players want to wear Nike… it has the vibe and the reputation of being the coolest apparel on the market. And, despite UA’s efforts, their unique uniform designs cannot compete with Nike’s pro combat counterparts. The uniforms worn by Navy Football during the 2008, 2009, 2010, 2011, 2012, and 2013 Army-Navy games are widely believed to be some of the best uniform designs in college football history… and that’s not just me talking, but the blogosphere as well. UA is great. Nike is better. It’s a two-way street though. You might want Nike to outfit all Navy sports, but if Nike doesn’t want to, it isn’t going to happen. If Nike saw the value in providing for all of Navy’s sports, they would have. They didn’t. To disagree with the decision means that you’d want NAAA to pay Nike to do something that UA is willing to pay NAAA to do, for the sole purpose of associating with the Nike brand name. I think you would agree that would be an irresponsible business decision. You might be able to make that argument if there was more risk involved in making the switch, but it’s not like UA is some fly-by-night operation. They’re a $2 billion company that already outfits several high-profile programs. That train of thought is similar to what Army went through when they chose to sign with ESPN over CSTV in 2005. Army thought that they would be better off partnering up with the “worldwide leader.” It’s good to have pride in who you are, but you can’t allow that sense of pride to distort your view of where you fit in the marketplace. ESPN, who already had contracts with just about every other major player in college football, brought Army back to reality in a hurry. They treated Army like an afterthought, putting most of their games on non-HD ESPN Classic with cut-rate broadcast crews and production quality. To ESPN, Army was just filler; a cheap way to get better Saturday ratings for a channel that would otherwise be showing reruns of past World’s Strongest Man competitions. Meanwhile, CSTV treated Navy as the crown jewel of its lineup, and fans knew that all their home games would be at 3:30 on Saturday. The difference was so great that Army actually worked with ESPN to end their contract early so Army could sign with what is now the CBS Sports Network in 2009. Granted, Nike’s relationship with Navy was far better than ESPN’s was with Army, but the point remains that there is a limit to the value of choosing prestige for its own sake. It’s hard to gain on the big boys if you play by their rules. When you’re a smaller program, sometimes there is value in doing things differently. Don’t discount the value of being located 30 minutes from the company’s headquarters, either. It only fosters more of a working relationship when you’re right around the corner. I can’t speak to what players want. If I was a player, though, I would want 1. the best equipment, 2. to feel like I was important to the company, and 3. to look good. Both Nike and UA deliver on #1. As for #2, I think Nike did value their relationship with the Naval Academy, but not as much as UA does assuming that the latter is making more of a financial commitment (and providing for all sports). As far as looking good goes, you will not find a bigger fan of Nike’s Army-Navy unis than me. While Nike gets a lot of credit for those, they didn’t do it alone. The equipment staff had a lot of input into those designs too. Those guys aren’t going anywhere. I’m not going to write off UA’s designs before we even see them. Besides, I don’t think you’re giving UA enough credit for their one-off unis. In addition to the Northwestern unis I pointed out in the post, Hawaii’s throwbacks were amazing (http://www.underarmour.com/shop/us/en/armoured/university-of-hawaii-uniforms). Texas Tech had a couple of cool ones too (http://www.underarmour.com/shop/us/en/armoured/texas-tech-uniforms5). There were also plenty of Navy fans that weren’t exactly thrilled with Nike’s Army-Navy one-offs, although anyone that didn’t like the unis the last two years probably wouldn’t like anything. UA isn’t perfect. I’m not too enamored with the way the company markets itself, for example (as a friend once put it, it’s very “meathead-y”). The pros far outweigh the cons, though. Nike was good to Navy, but I think there’s a higher ceiling with Under Armour. Not sure who you are talking too as far as the players. The players are way excited about the switch to Under Armour. At least the football players are. I just saw that Notre Dame and UnderArmour just signed a $90M deal to outfit all teams so to me that is a good thing for the company. If Navy fans think UA would do anything with our colors/traditions, they just signed up the most (overly) traditional non-SA university in America.